As promised here are the swatches of Manglaze Matte Nail Polish in Mayonnaise from my first ever Manglaze Haul. I'll get the other two Lesbihonest and Matte is Murder up soon. It seemed everyone was most amused by the name of this one and it has been demanded that I show it asap, so here it is! Manglaze is based out of Chicago, IL and first had their debut in Japan in 2007. This is not just another boring white polish because it is matte it's really something you have never worn before. A truly matte polish that covers in one coat, I prefer two for that extra matte-ly goodness tho. In the photos I used two coats and please forgive my painting skills I've never been able to color inside the lines. This has a pretty quick drying time quicker than your regular shiny finish polish. I was able to sit still long enough not to smudge it so it must dry in under 3 mins.... because that's about how long I can go without moving around. When I first put this on I used a clear base coat but I found that the base made it chip like crazy, I blame this one the base tho. The next time I used this I just buffed my nails a bit before applying and it lasted 3 days with no chips on my natural nail. Now you can add a shiny top coat but why ruin a good thing? It does look pretty spectacular with one but I think it looks just as good the way it is. Ingredients: BUTYL ACETATE, ETHYL ACETATE, NITROCELLULOSE, ADIPIC ACID/NEOPENTYL, GLYCOL/TRIMELLITIC, ANHYDRIDE COPOLYMER, ACETYL TRIBUTYL CITRATE, SILICA, ISOPROPYL ALCOHOL, BISMUTH, OXYCHLORIDE, ACRYLATES COPOLYMER, STEARALKONIUM BENTONITE, TITANIUM DIOXIDE, STYRENE/ACRYLATES, COPOLYMER, N-BUTYL ALCOHOL, BENZOPHENONE-1, TRIMETHYLPENTANEDIYL, DIBENZOATE, POLYVINYL BUTYRAL 11 ML 0.37 FL. OZ. ©ManGlaze¨ INK. Chicago, IL 60626 Made in U.S.A. I know this is bad but I have never heard of this line until your post last week.....and they're based in CHicago! I am so such a moron! Aww Bessie no your not I don't think they have an actual brick and mortar store more of an online presence I heard about them from a nail blogger I follow and fell in love! You should try them out I highly recommend this one! oh my word. I WANT this polish! I love the packaging too!!! You should check out some of their other label artwork it is really impressive! Lesbihonest sounds interesting haha. wonder what colour that will be! 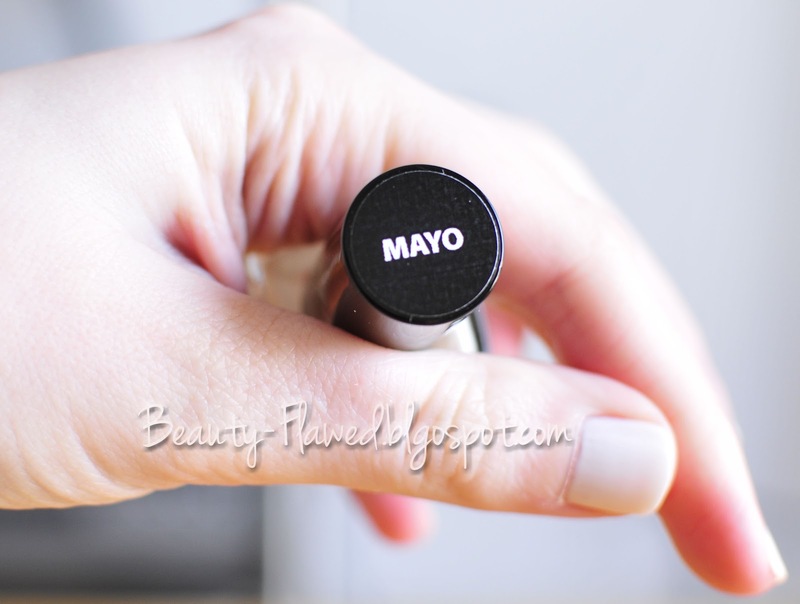 haha and the matte white for Mayonnaise is pretty interesting too...although I'm not sure how I would wear it! So interesting!! Need to look up Mayonnaise! You're right! The name is amusing but the color looks pretty cool!